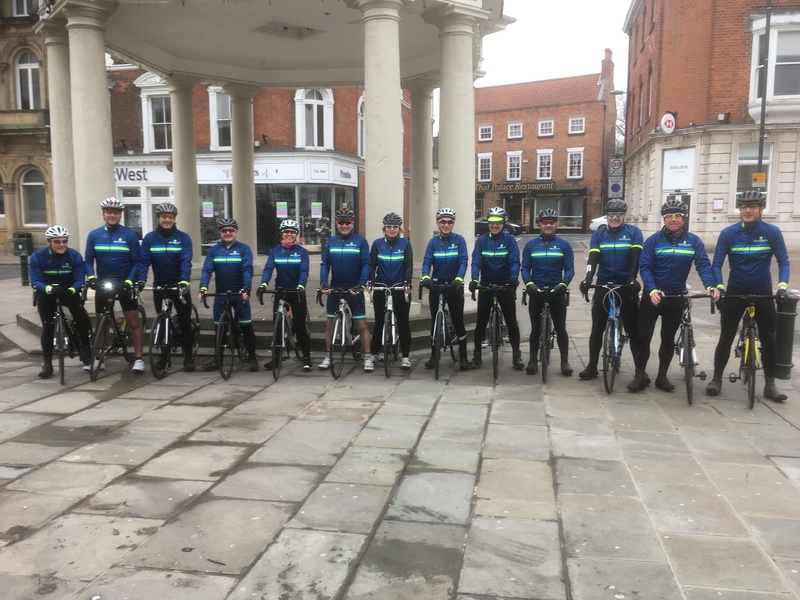 “Blistering Barnacles” what a great turn out today, all dressed up in our No.1’s; well, all except Martin, stubbornly clinging on to last years kit!! Can’t waste good quality gear. His punishment was to be the designated “grande depart” photographer. It was another rather dull day to greet us but with little wind to speak of, made it feel slightly warmer than of late. Warm enough for two knights to don shorts with the rest keeping legs under wraps waiting until more clement weather. With everyone in good spirits, we set off at a steady pace along the Molescroft road to Dog Kennel round-about and onto Cherry Burton. Colin, being troubled by an annoying “clicking” sound, pulled over to the side to investigate allowing everyone else to regroup before continuing to Etton then out towards Kiplingcotes. The road surface along the Spring road has seen better days so vigilance for pot-holes and gravel was order of the day. On reaching the outskirts of Market Weighton, we had brief stop, which coincided with Neil’s phone ringing. How did we manage before mobile phones?!! 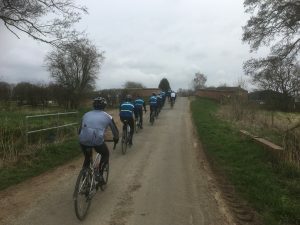 We then set off down Red Lane towards Goodmanham then onto the Londesborough road, over the A614 roundabout and it was onto a long sweep down Intake Hill. A good chance for a breather before the first lung buster climb up to Burnby Lane. On reaching the top of the climb, it was a chance for some to recover, for others it was a pee stop. Don’t look now Heather/Jenny….oh too late! Nothing to see anyway!! A few photos then it was down the slope to Burnby then onwards to Pocklington. On the way there were reports of a “loud bang” indicating a puncture. Fortunately it was not one of our group, probably one of the several groups we passed during the course of the day. It was around this time that Colin decided to return home with suspected wall damage to his rear tyre. After regrouping next to the Rugby club, we had a bit of traffic dodging through Pocklington to get us over the main A1079. 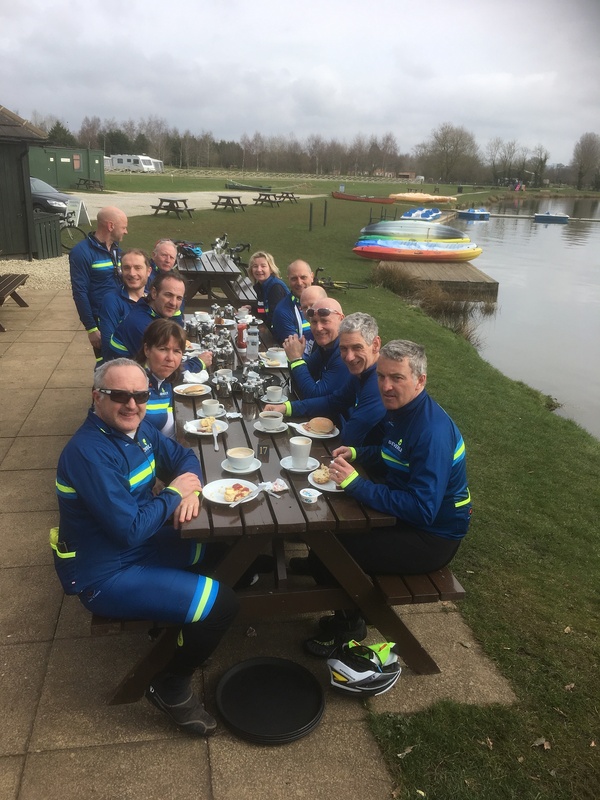 A lovely flat run along the Allerthorpe road and a sprint for the Allerthorpe Lakeland park café saw us arriving earlier than expected. A very warm welcome awaited. Service was quick and efficient so it’s no wonder there were a number of other cyclists as well. It was warm enough to sit outside with a lovely back drop of the lake. Music was provided courtesy of Neil’s phone. Turns out he was the “birthday boy” receiving greetings from family. With thirteen at the table it felt a bit like the “Last Supper” until Jim arrived unexpectedly as a late substitute for Colin. At least Martin was no longer the only odd man out. Suitably refuelled, the pace picked up on the fast flat roads through Bielby, Everingham and Harswell. The clipper ships of Dave W, Mike & Pugwash taking turns to set the pace until reaching the A614. A brief sprint down the main road and a regroup on Cliffe lane, then a new group took up the pace setting. From North Cliffe, Brian was the main pace setter most of the way to Hotham. After so many flat roads the short sharp lump of Common hill provided a bit of a tester for legs beginning to tire. The convoy then spread out before regrouping at South Newbald. Nobody was keen to take on the trial of Trundlegate, so continued on to North Newbald before taking the Walkington heads road back towards Beverley.